Please REFER TO OUR SIZE CHART and MEASURE YOUR PET'S SIZE and WEIGHT before payment,choose a little bigger size or take each measurement a bit loosely will be more comfortale for your pet. If any of the measurements are between two sizes, choose the larger size. 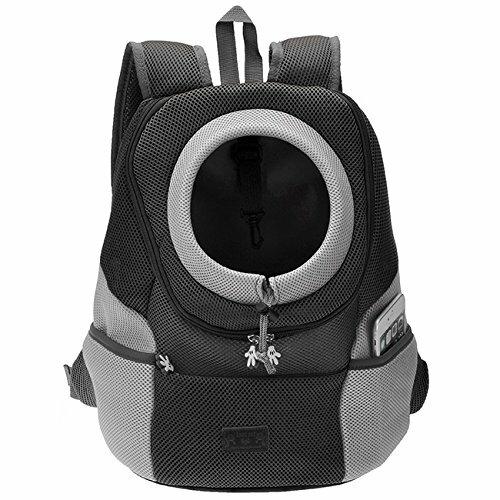 1.Made of strong and sturdy canvas, the carrier is quite comfortable for both you and your little pet. 2.Large compartment store toys and food for your dog. 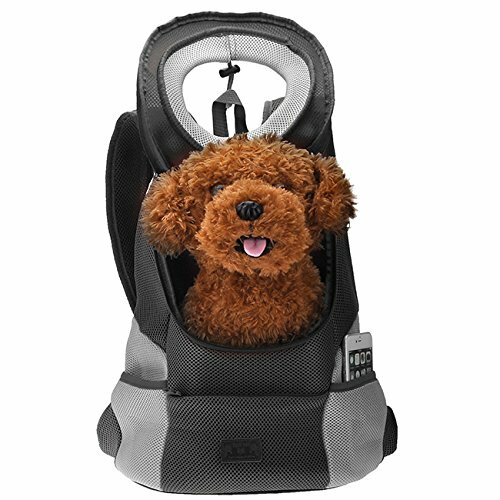 With air mesh panels on the carrier, the dog could breathe easily. 3.Elastic design in the neckline, can adjust it for pets comfortable feelings. 4.Inside hook design connects to pet's collar through slightly direct pressing against collar's loop to prevent pet get out. 5.Design Waistband: To reduce shoulder pressure. 6.High resilience provides the protection of buffer, light, washable, and non-toxic environmental protection. 7.Suitable for Cat, Mini poodle, Mini Schnauzer, Mini Teddy, animals, Chihuahua, Yorkshire, Pomeranian, Minlature Pinscher and etc. Material: Durable mesh fabric and oxford fabric; Solid stitches ; Soft-padded adjustable shoulder straps. 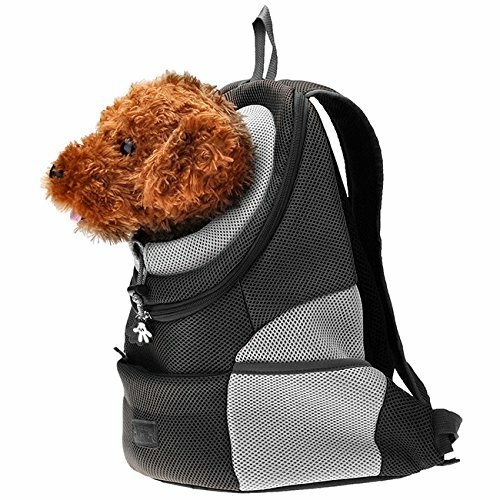 In the side and front pockets, you can put small stuff of your own or snacks water for your pet. 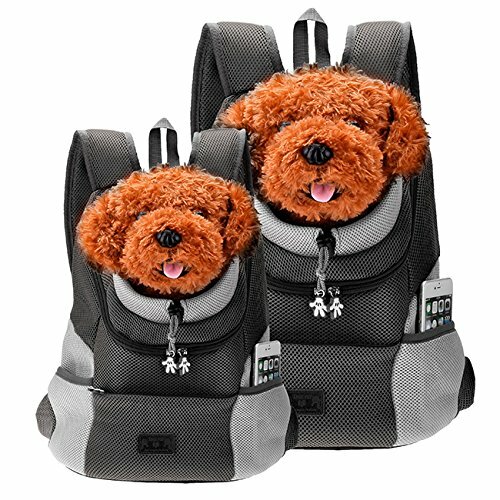 The buckle design inside the carrier can connect with pet's collar, which will prevent pet get out and protect the safety of pet. The front hole is adjustable based on the neckline size of your pet. Wonderful backpack for you to carry your pet dog cat go out and travel. Size Medium: top width 7.8"; bottom width 12.0"; height 13.3"; neck hole size 7.1"-18.8" . 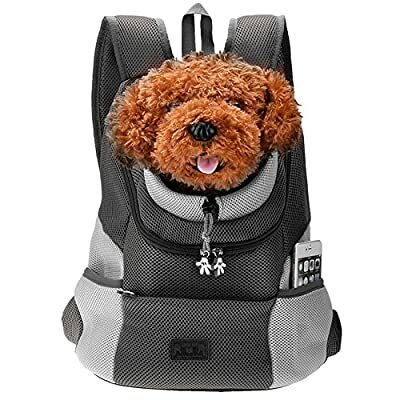 It fits pet less than 8.8 lbs .Size Large: top width 8.0"; bottom width 14.2"; height 15.7 "; neck hole size 7.2"-21.2". It fits pet less then 15.4 lbs. Size Extra Large:top width 8.6"; bottom width 14.9"; height 17.8"; neck hole size 7.1"-22.6" . It fits pet less than 16.5 lbs.Please choose the right size.